This Season’s The Walking Dead keeps hitting it out of the park in terms to brutality, comic tie ins and overall quality of writing; and this week was certainly no exception. So let’s take a closer look at this week’s episode and bid a heartfelt farewell to someone who quickly became one of our favorite characters. As predicted last week, Bob was indeed bitten by that skeletal walker in the watery Soup Kitchen basement. So when the Termites – now Hunters – were chowing down on his leg, they didn’t realize they were eating ‘tainted meat’. Again this entire scene was straight out of the comics with the only difference being it was Dale – not Bob. Additionally, much like the comic, the Hunters never lived long enough to see if the cooked tainted meat would affect them. The Walking Dead has rarely explored the science behind zombies – unlike other zombie shows/movies – so leaving this whole scene again to imagination was probably a good call. We still don’t know why some people turn faster than others. We learned Season 1 that once the virus hits the brain it’s all over; and considering Bob’s bite was by his neck it’s surprising he didn’t turn sooner. Though as Glen reminded us, back in Season 1 Jim lasted almost two days before he succumbed to his chest wound on his chest. An additional homage to the comics came during Gareth’s discussion with Bob. As I mentioned in the premier, Terminus Mary was Gareth’s mom and Alex his brother. Gareth proceeds to confirm all this as well as explain the process by which people would be recruited into Terminus – again, as previously mentioned. During this talk, Gareth gives Bob the summary of the “speech” in which he convinces someone that cannibalism is natural and uses bears as an example. This speech actually also comes from the comics; but in a slightly different context. Instead of it being a rehearsed sales pitch, this is what Gareth – Chris in the comics – says when begging for his life with Rick. He tells Rick that it’s what had to be done and goes further to suggest that he even had to eat his own children to survive. Once again, another great comic to television conversion. Though Gareth and the Hunter’s didn’t just keep Bob alive to shoot the breeze, give back-story and offer comic parallels. There was actually a grander plan to once again lure Rick and them into an elaborate inescapable trap. Most comic fans would have seen Bob’s initial return as ‘the trap’ to lead the gang out of the church and into a shootout, which would then end in Rick and then following the hunters back to their camp to finish the job. What transpired on the show wasn’t only a trap for Rick but also these comic fans. Gareth had hoped that firing a wide shot or two while luring them out of the church would drive Rick and the gang into a frenzy. With Bob still alive to tell them everything, Rick and the gang would seek vengeance and not think straight – thus leaving the weak behind and taking their strongest fighters with them. While Rick and the fighters would head toward the encampment, Gareth and his team would overtake the weaklings in the church. Even more devious was how the glass holding back the zombies at Gareth’s encampment was starting to fracture and would be completely broken by time Rick and the gang arrived, serving as a sort of walker time bomb – similar to what Rick did to Joe’s group in the house during Season 4. Thankfully, Rick and the gang were thinking straight and were able to save the day. The moment we saw the camera linger on the path to/from Father Gabriel’s church, we knew something bad was coming. Thankfully, Rick and the gang had already anticipated it. They knew they were being watched and suspected if they’d leave in a big group, they’d invite the Hunters right to their door. So rather than fall into the trap, Rick and the gang doubled back quickly just in time to silence the last of the Termites once and for all; and my God was it gruesome. Aside from Rick and the gang’s aim improving incredibly – shooting Gareth’s fingers off – Rick, Abraham and Sasha eviscerated the remaining three Termites. 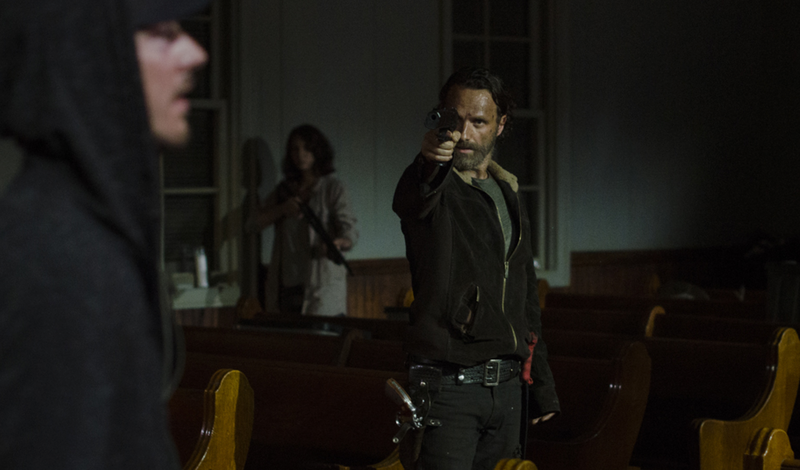 It’s important to note that this massacre wasn’t film inside an actual church; but beyond that we can start to see how Rick and the gang is changing based off their last encounters. Despite Gareth trying to explain himself and beg for his life, Rick knows that if it’s not them, Gareth and his people will hurt someone else. As for why Rick didn’t just shoot them, they “didn’t want to waste bullets”. Though it’s important to note Rick’s weapon of choice. The red handled machete was actually the one seen in the first episode at the trough when Rick promised Gareth that is what he was going to use to kill him. Promise kept. Though no matter how gruesome this scene was, it was balanced by the awful acts the Hunters had and would commit. Also, this is the second time Martin threatened a baby – he deserved every single one of Sasha’s guttings. This new Rick – and the group at large – is more ferocious than before; and we can already see this not sitting right with some – ie: Tyreese, Maggie and Glen’s looks of horror during the massacre. Though all in all the groups moral compass is still there. Fool me once, shame on you. Fool me twice, shame on me. At least that’s what Abraham is probably thinking right about now. You might be wondering why he was so aggravated and ready to leave in this week’s episode; but remember what’s happened in the past. The first time Abraham said let’s go to DC, they convinced him to go to Terminus first to “stock up” – and we know how that ended. So when the group convinced him to stop at the church to again “stock up” only to have themselves again besieged by cannibals, is WAY too much déjà vu for him. Abraham tried being nice and reasonable; but now he’s calling the shots. This was even the first time we saw him shut down Eugene, which is usually the other way around. He’s not taking opinions from anyone else anymore; but thankfully he did reason to stay a mere 12 hours if it’d give him 3 extra hands on his journey – Maggie, Glen and Tara. After last Season, I was pretty certain everyone agreed “splitting up the group was bad”. This timing only gets worse when you realize if he’d have stuck around for a full day – rather than just half – he’d be in time to see Darryl return. My spidey-sense is tingling again – and by that I mean my BS Detector – which makes me feel Eugene doesn’t actually have a cure. This idea is being built up quite a bit and seems too good to be true. And if we’ve learned anything lately, it’s that things too good to be true usually are. Is there an eventual end for all of this? Most likely; but I doubt it’ll be as easy as Eugene makes it out to be. Bob might have come to the group as a loner who thought he’d die alone; but he actually died surrounded by loved ones. Just as when Dale died and the groups conscious became Herschel; and when Herschel died and it became Bob; so too now does the groups conscious have to become someone new – probably Tyreese from the look of things. It might not have been long; but Bob inspired the group and his words will stay with them. In fact, Bob had most of the amazing quotes for this episode. Tell me you didn’t shed a tear and smile when Bob told Sasha “I knew when I told you, it’d become all about the end. And I really like the middle”. Right in the feels! 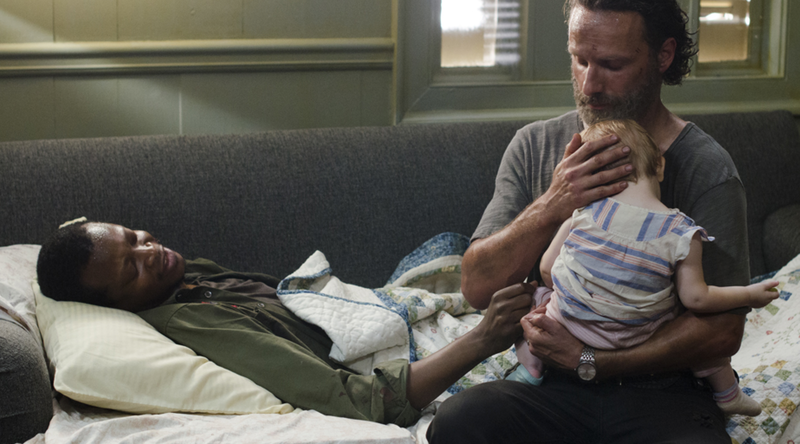 Though more than his charming flirty self, his most powerful words are the ones he says to Rick on his deathbed. It reminds us that whether this nightmare can end or not, you mustn’t let it end who you are. This advice will become pivotal as Rick and the group try to balance between the brutality they’ve experienced lately and still trying to be good people. The opening scene with Gareth and the Termites/Hunters talking to/eating Bob is interspersed with shots of the walkers clawing at the window. This is intentional to create a direct juxtaposition between the walkers and the cannibalistic hunter – two groups that have devolved and have almost 0 humanity left. Which is worse? You decide. When Rick said “it could have been us” after slaughtering the Termites/Hunters, there is a double meaning to this. On one level, it means that it could have been they themselves who’d be slaughtered if the roles were reversed. Additionally, it also means that if things had gone differently, Rick and the gang could have been just like them. There was a mural on the Church Wall saying “Stupidity is also a gift from God, but one mustn’t misuse it”. Wise words. Let’s see if/how this comes into play this season. 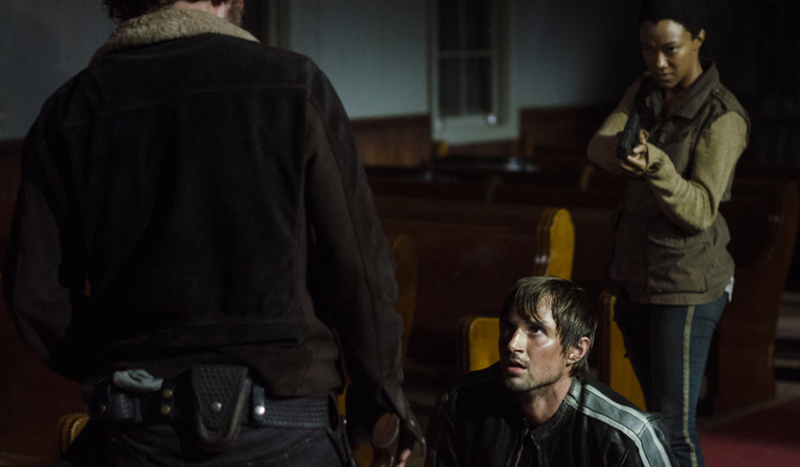 Despite Sasha and Rick wanting to gut him at the start of the episode, Father Gabriel is slowly working his way into the group and offering to help. This comes after we learned what he did that he can’t forgive himself for. Apparently, a group of people gathered outside his church early one morning and was cursing for him to unlock the doors. By time Gabriel got there it had turned into a mob that had attracted a bunch of walkers. Too scared to open the doors, Gabriel sat locked in the church while he heard everyone die cursing his name. When Tyreese was telling Sasha to ‘forgive’ what happened to Bob, he wasn’t saying that they shouldn’t make the Termites pay. He was saying that it shouldn’t be her job and that she should stay by Bob’s side in his final moments. He remembers how blinded with rage he was after Karen’s death; and how most of that was so that he couldn’t feel the regret of not being there with her in her final moments. The episode title comes from Maggie’s response to Father Gabriel exclamation “This is the Lord’s house” when he was the massacre. Much like how Gabriel told Rick the wine isn’t part of the Eucharist until it’s blessed, this continues the idea that this world changes things when it comes to spirituality. That as far as walkers, cannibals and lowlifes see it, a church is no place of sanctuary; but rather just “Four Walls and a Roof”. This is especially poignant coming from Maggie, who father was so religious. Next week’s episode will finally give us the answer to something we’ve been wondering for a third of a season: WHAT happened to Beth? Darryl’s returned to the camp and possibly has answers; but where is Carol. Was she who he called to to “Come Out” or was it someone else? Stay tuned!